There's a signal up the block, but looking left—there's a gap in traffic. Looking right—there should be enough time to make it all the way. Midway across she picks up the pace as some vehicles have changed lanes and are closer than she thought—now traffic is coming towards her from both directions. She is stuck in the middle of the road, keeping her feet on the yellow lines while waiting for traffic to pass so she can make it across the rest of the way. That's when it happens…a truck passing by clips her while she stands in the middle of the road. He slams on the brakes once he realizes what happened—but it is too late. Pedestrian crashes account for about 12 percent of all traffic fatalities annually. Over 75 percent of these fatalities occur at non-intersection locations. On average, a pedestrian is killed in a motor vehicle crash every 120 minutes and one is injured every 8 minutes.2 Many of these crashes are preventable. By providing raised medians and pedestrian refuge islands, we can bring these crash numbers down, prevent injuries, and save lives. The median is the area between opposing lanes of traffic—a median can either be open (pavement markings only) or they can be channelized (raised medians or islands) to separate various road users. Providing raised medians or pedestrian refuge areas at pedestrian crossings at marked crosswalks has demonstrated a 46 percent reduction in pedestrian crashes. 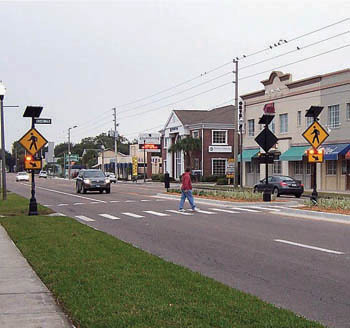 At unmarked crosswalk locations, pedestrian crashes have been reduced by 39 percent.3 Installing raised pedestrian refuge islands on the approaches to unsignalized intersections has had the most impact reducing pedestrian crashes. Crossing the street can be a complex task for pedestrians. 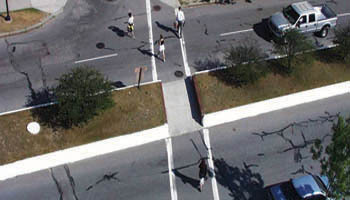 Pedestrians must estimate vehicle speeds, adjust their own walking speeds, determine adequacy of gaps, predict vehicle paths, and time their crossings appropriately. Drivers must see pedestrians, estimate vehicle and pedestrian speeds, determine the need for action, and react. At night, darkness and headlamp glare make the crossing task even more complex for both pedestrians and drivers. Providing space for landscaping within the right-of-way. Providing space to install additional roadway lighting, further improving the safety of the roadway. Providing space to allow for supplemental signage on multi-lane roadways. 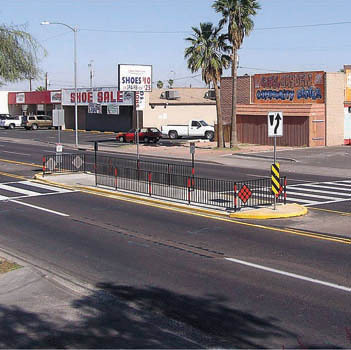 On refuges 6 feet or wider that serve designated pedestrian crossings, detectable warning strips complying with the requirements of the Americans with Disabilities Act must be installed. Medians are especially important at transit stop locations. Transit stops are frequently located along busy arterials at uncontrolled crossing locations. Providing medians can make these crossings safer and more appealing to existing and potential transit users. Sunken Gardens, in St. Petersburg, Florida, is a popular tourist destination. Across the street are a number of local dining establishments with no safe way for pedestrians to cross the street. Sunken Gardens is located on the east side of 4th Street North (US 92). The road averages 31,500 vehicles per day with speeds averaging more than 10 mph above the legal limit. To aid pedestrians in crossing 4th Street, the City of St. Petersburg installed a raised pedestrian refuge area in front of Sunken Gardens. The raised pedestrian refuge area made it possible to install a supplemental traffic control device—a Rectangular Rapid Flashing Beacon (RRFB). Installed on roadside poles, the RRFB remains dark until a pedestrian activates the system by pressing a push button. Once the system is activated, rapidly flashing amber beacon (rectangular strobe) lights provide a bright warning to motorists.8 In the first week after the raised pedestrian refuge area and RRFB were installed, over 900 crossings were reported with over 85 percent of motorists yielding to pedestrians. Wilson, Petritsch, Quantifying Countermeasure Effectiveness—Orlando, FL, PBIC, November 2008. 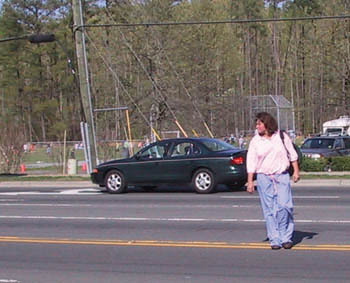 NHTSA, Traffic Safety Facts 2008 Pedestrians, NHTSA, Washington, DC, 2009. Lindley, J., Guidance Memorandum on Consideration and Implementation of Proven Safety Countermeasures, FHWA, Washington DC, July 2008. FHWA, Desktop Reference for Crash Reduction Factors, FHWA, Washington, DC, September 2007. TRB Access Management Manual, TRB, Washington, DC, August 2004. 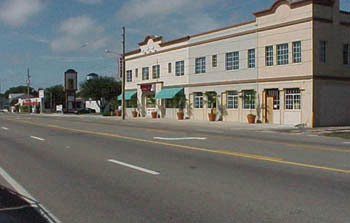 Florida Department of Transportation, Florida Pedestrian Planning and Design Handbook, FDOT, Tallahassee, FL, 1996.